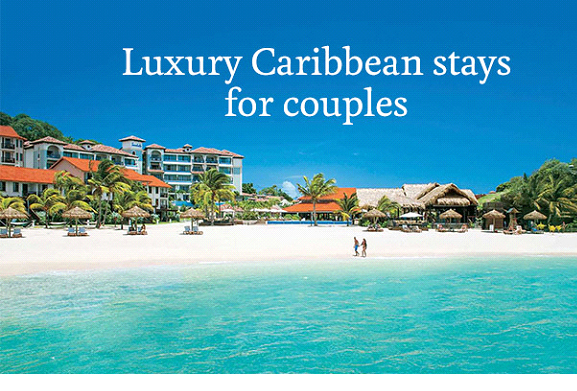 Sandals has an award-winning Luxury Included® concept, with more quality inclusions than any other resort on the planet. Each retreat has an incredible beach location, innovative rooms and suites and five-star Global Gourmet™ dining, with some resorts offering a choice of up to 16 restaurants, including fine French cuisine with white glove waiter service. Premium wines and spirits, water and land sports are also included, as well as golf at selected resorts in Saint Lucia, Jamaica and the Bahamas. This is the perfect choice for a romantic stay or honeymoon. Stay in a Sunset Bluff Honeymoon Luxury Club Level Room at Sandals Grand Antigua Resort & Spa and enjoy panoramic views of Dickenson Bay, private check-in and a weekly snorkelling trip included. The Caribbean Oceanview Penthouse Club Level Rooms at Sandals Grande St Lucian Spa & Beach Resort have views towards the island of Martinique. Benefits include exclusive events such as wine tasting and a cocktail party. Save up to £5916 per couple with a stay at Sandals Barbados in a Crystal Lagoon One Bedroom Butler Suite with Soaking Tub, a luxurious suite with a large living room, a hot tub on the balcony and Butler Service. Stay in a South Seas Grande Rondoval Butler Suite with Private Pool Sanctuary, one of the best room types at Sandals Grenada Resort & Spa. Your private garden will have its own pool, whirlpool and waterfall.